Ellen grew up in Manhattan, Kansas, surrounded by the Konza prairie. Being so close and connected to nature, she was inspired by both its beauty and biology. She received her Bachelor of Fine Arts from Emporia State University with a Printmaking major and Biology and Art History minors. After gaining experience in both fine arts and healthcare, she decided to combine her passions by becoming a medical illustrator. Ellen completed her Master of Science in Biomedical Visualization at the University of Illinois at Chicago in 2017. There, her research project was a 3D animation of the protein interactions involved in synaptic vesicle exocytosis. She was also an intern at the Journal of the American Medical Association, where she received professional training in medical illustration and design. 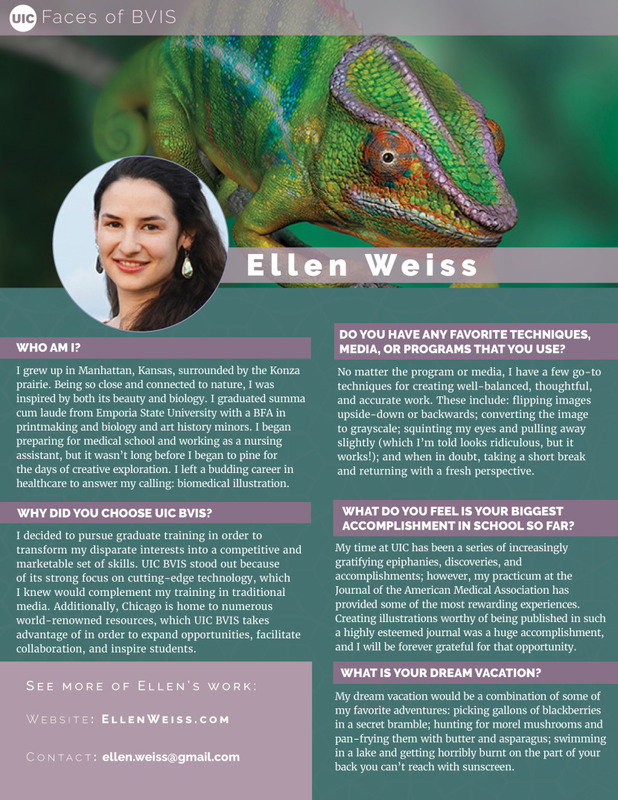 Ellen now works as a medical artist for Wolters Kluwer in the downtown Chicago Emmi office. There, she creates 2D assets and animations for patient engagement solutions. Check out my feature on my alma mater's website. Check out my feature in UIC Biomedical Visualization's blog.